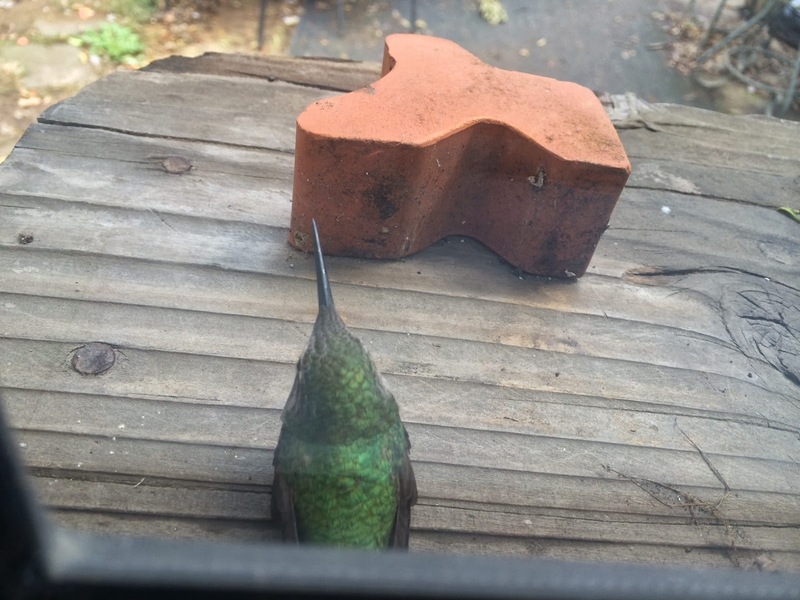 Recently, a little hummingbird blew off course and smacked into my window. I have a feeder out back, and I've enjoyed watching two little birds share it over the past year. I've gotten to know them a bit, so I was quite upset to hear the bang and then see this little guy stunned and hunched on my windowsill, breathing heavily. After googling what to do, I got a dropper, filled it with hummingbird food and placed it on his beak. I also stroked him, trying to warm him. After five minutes or so, suddenly, he flew upwards, hovering near me for a few seconds as if to say "Thanks," or more likely "Don't freaking touch me again!" and then flew into the tree I knew was his home. He's been back at my feeder ever since. I, too, have been smacked hard the past few years. Cancer, surgeries, years of chemo, sepsis, gamma knife radiation, all left me stunned, splayed out, blinking. But the hands of my friends and family warmed me and gave me the strength to recover a bit. I'm now flying up, feeling less stunned, even finding feeders on my own. 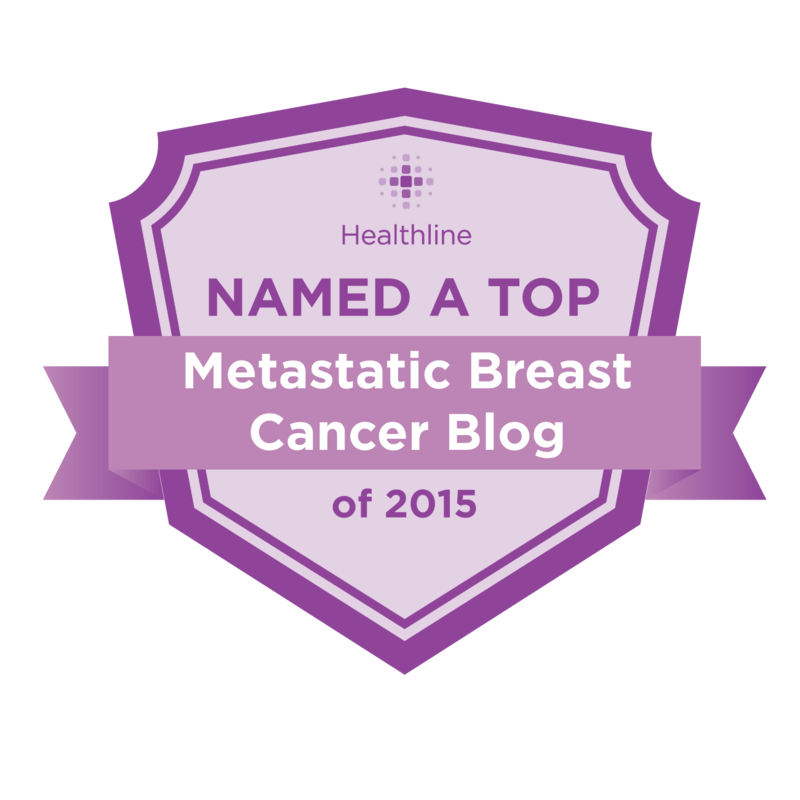 I heard a wonderful analogy by an oncologist about metastatic breast cancer treatment. It is like climbing a mountain with no peak, he said. You have to put one foot in front of the other. The snow is deep, icy particles are blowing at you, you can't see what is ahead but you must keep trudging along, blinded, step after step, year after year, pain and discomfort your partner. You slog through the white cold, hoping to someday find a resting place and get a break. You suddenly emerge into the sunshine, into remission, into a beautiful meadow where you can rest and warm, recover and nourish yourself, but sooner or later, you will be called to start your climb again. And of course, at some point, your climb will be over and you will be left on the mountain, stilled, eventually covered in snow, like all mountaineers. Right now, after 4 1/2 years of trudging, I have found a meadow. I'm resting, with hummingbirds buzzing about, flowers blooming and the grass tickling my legs. I confess, I want to stay here forever. It is interesting and amazing that our minds go back to normal so quickly when we feel better. While I still am administered Herceptin, Perjeta and Zometa, I have not been on an actual chemo drug since July, and I've been recovering ever since. As much as I accepted my fate, my disease, and my end, that's how quickly I've accepted my returning health. I never mention cancer anymore, when it used to be a daily topic (and one quite boring for my family, I know.) The cancer card now seems unfair to play or use as an excuse, and I once again know many people worse off than me, which was not always the case. Before, I got angry if anybody mentioned making plans with me. It showed, I thought, they didn't understand cancer. I wasn't able to plan for tomorrow, much less 2 weeks down the road, and why didn't people recognize that? (Those who lived with me understood because they saw what I had to contend with, but those who didn't never quite "got" it.) There is no way I could know if I would be out of bed the next day, much less in a week. To the healthy, this doesn't make sense - how much could change in a day? But those of you with serious disease understand. I was way too sick, I didn't get out of bed half the time, how would I know how I felt in two days time? I promised nothing - there was no future. There was only today. Now I am thinking about summer, maybe some minor travel, certainly visits to my as-yet-unborn grandchild, maybe a last vacation before my youngest starts college. I'm thinking about my 20 year wedding anniversary in September, and the weddings of other family members. I'm thinking how weak I am after years of inactivity and how I need to get stronger to do what I want to do in the future and planning how to accomplish that. Before, I both did and did not realize how sick I was. I was in pain, sometimes I spent days asleep without even waking. My head felt wrapped in cotton and my thinking was fuzzy. Still, after years of treatment, it felt normal. I wasn't unhappy - I enjoyed my family, my little cat, watching my hummingbirds, but my life was very diminished. There was only that minute and nothing else. Now, I have a freelance writing job because I can keep a deadline again. I scrapbook and organize my scrapbook room (a never-ending job) and buy product for pages I have planned and don't worry about spending money on something I may not use. I signed up for a 3 month class. I am feeling well enough to volunteer a little: I recently helped at Science Olympaid, as I did in that post from 2010. My son is no longer involved but still, I enjoy doing it and this year I promised I'd be there. The future is no less illusory than it was before. I see the doctor on the 12th. Ominously, I have some twinges in the liver again, like I did when cancer was growing. I could have a scan the 14th and hear the 19th that cancer has spread through my liver or is in my lungs or brain. I could be in treatment again before the month is out, and be gone in 3 months. That is the way cancer works. That's what it did to my friend Sandy, who was feeling fine and planning a Canada vacation when she suddenly discovered it in her brain and died a few months later. That's what it did to many before her. Or, I could be one of the rare lucky ones, those with metastatic breast cancer who get two years in remission, or four, or even a decade. Why not me? It feels now like it's possible, although the odds remain the same. It is amazing what being off chemo and feeling good can do to your outlook. It won't last forever, and I am very aware of that. It may not last a month. But for now...it's wonderful, and I confess, I'm used to the idea of a future again and it will be a huge blow the day I hear that it is pulled out from under me again. We humans, we fill with hope so easily. It is simple to imagine I will be given everything I wanted nearly 3 years ago when diagnosed with mets. I wanted to live to see my son graduate high school, which happens in June. I wanted to see a grandchild, and my stepdaughter is keeping us waiting as the baby was due a few days ago. I wanted to see my oldest son get a job with a good company that can offer a future, which has happened. I wanted to know where my youngest son would go to college, which we will discover by April 1st. Yesterday, the phone rang with his first acceptance - to UC San Diego as a Regent's scholar. 13 more schools to hear from before the decision is made, but now, we know for sure he's going somewhere good. It's all I could have asked for and it is all coming true. When I see those things happen, (yes, I said when) I may set more goals. I have an older son who will hopefully be getting married, and I'd like to see that. I want my younger son to discover his career in college and come home to tell tales of fun and learning. Maybe take a trip for our anniversary. I am greedy. I want more life. I was prepared to not have it, and now I am prepared to continue on. Of course, you never know, I could still get hit by a bus. Until then, I have to say, this meadow is gorgeous and the mountains I have yet to climb seem very far off. I hope I get to sit here and rest for a good, long while. I so enjoy your writing and am thankful you are doing so much better. So glad you are getting the grandbaby and to see your son graduate HS. I too wanted to see a grandchild - he turned one last week and said "grandma" the week before. I wanted to see my youngest graduate from college and that too happened. When you are in the meadow (love the analogy) it is nice to put cancer if not totally away, at least to the side instead of dominating everything. To actually be able to live for a while rather than merely exist. May you enjoy being a grandma and actually hear him or her say "grandma' (or whatever you choose to be called). May you not just see HS graduation, but college as well. And may you stay in the meadow a very long time. You are in my prayers (yes, I know you don't believe) and I wish you joy and peace. Ann you have a wonderful way with words and explaining how you feel. I'm sorry that you know your topic so intimately but I know that you have helped so many ladies feel like they are not alone going through their fight. That's nice to hear. Nobody should feel alone! Thanks Jill! I always was living but now I'm doing it feeling good and it is a better way to go, I must say. It's crazy hard to descrbe because there is still pain and stuff I have to deal with but also mixed with a healthy feeling that I hadn't felt in a long time. Is good! Great post, thank you! So glad you are enjoying this time. Someone has to be the outlier...I hope it's you! I too want you to be an outlier! Definitely have to try that. THe weather has been 70 all winter so I should have been out more. But I'll start....be good for my aches and pains too as I'm sure inactivity plays a roll in some of that. What a wonderful post. It has made my day to hear you so full of joy…and I'm so glad that you get to live that happiness. Enjoy your time in the meadow; you deserve it. This is such good news, Ann! So happy to hear that you are out and about and enjoying your life. Congrats to your son and his first college acceptance. Congrats on your soon-to-be status change to Grandma! You are one lucky lady. I am completely understand you not as a cancer patient as a caregiver. My husband has stage IV pancreatic cancer and every few months there are new tissue growing somewhere. I am working in 6 hours distance from him and my daughter just to keep our insurance and I am going back on the weekend. Cancer is not easy not for patients nor for their families. Just live the best of the life..
You are in my thought and prayers. Glad you are feeling more positive and healthy. I don't usually go to your page because I found it so negative. Glad to see you turning a corner. Thank you Julie. For some people, just hearing about illness and death, even if it is not in complaint form, is negative. This is their own fears showing and not a reflection on me or what I've said. I am going to continue to face whatever happens to me without hiding it and if people find that truth negative, it's on them, not on me. I have been following you for a while and am so happy to hear about this time of renewed health and energy. I hope it lasts a very long time. I want to say congratulations to your son on his acceptance at UCSD. I am an alumna and know how picky they are. I went to Revelle College and stayed at Argo Hall my first two years. They gave me a wonderful gift - a Renaissance-type education with exposure to so many different areas of knowledge that I have been able to build on for the rest of my life. In how many schools would you be able to study calculus, molecular biology, Italian, quantum mechanics, representational painting and Icelandic sagas and still graduate in four years? I'm sure your boy will make the right decision among the many schools that will accept him and I'm sure that, if he attends UCSD, he'll look back on it as the best investment of his time and energy that he ever made. Plus, living and learning on a beautiful forested campus right above the beach for four years isn't half bad, either. Great to know, thank you! He has now been accepted into five colleges out of seven we've heard from, and 14 he applied to. We are waiting on another seven which will happen by April 1. I will post all of that when we hear from them all. If he is struggling picking one, we may ask for more information and personal stories. I did show him this, but I think Caltech (one of the acceptances) is his first choice right now. Thank you for sharing your story!! I am 28yrs old and living with metastatic breast cancer and it is refreshing to see someone living and enjoying the moment!! It is a long journey, but without it would we recognize what a wonderful life we really have?? Glad you shared where I could find you. This is beautiful. Thank you for sharing your journey. I look forward to reading much more as you continue to travel bravely.